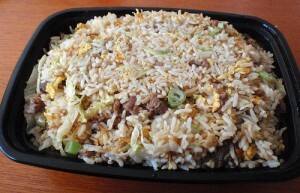 Beef Fried Rice recipe by Saira Yasir at DesiRecipes.com. In a medium bowl, combine the beef with 1 tablespoon of the soy sauce, 1 teaspoon of the sesame oil, and a pinch of redpepper flakes. Stir in the rice and boil until just done, about 10 minutes. Meanwhile, heat a large nonstick frying pan over moderately high heat. Put the beef mixture in the pan and cook, stirring occasionally, until browned and just cooked, 1 to 2 minutes. Put the watercress and the teaspoon of soy sauce in the pan and cook until the watercress is just wilted, about 30 seconds. Put a few drops of sesame oil in the frying pan. Add the egg to the pan and cook until just done, about 30 seconds. Remove from the pan and cut into thin strips. Heat the cooking oil in the pan over moderately high heat. Add the spring onions and 1/8 teaspoon redpepper flakes and cook, stirring, for 1 minute. Add the cooked rice to the pan and heat, stirring, for 3 minutes. Add the remaining 2 tablespoons soy sauce, the beef, watercress, and egg. Heat, stirring, 1 to 2 minutes longer. Drizzle the remaining teaspoon of sesame oil over the top.